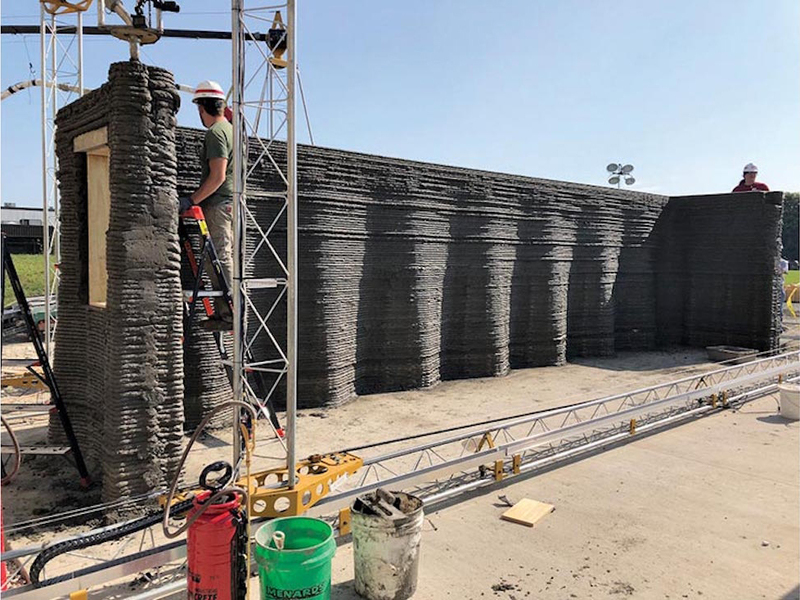 A research team within the U.S. Army Corps of Engineers recently 3-D printed full-scale concrete walls in an effort to create quick-to-assemble barracks for field housing, according to Engineering News Record. The project, named Automated Construction of Expeditionary Structures (ACES), aims to engineer structurally efficient and safe concrete barracks with precast roofs and 3-D-printed walls. In their latest tests, they were able to produce 9.5-foot-tall reinforced concrete walls for 32-foot by 16-foot barracks, made from about 25 cubic yards of concrete. The next phase of the testing will tackle printing concrete roof beams. Backed by the U.S. Marine Corps, Caterpillar Inc., NASA’s Marshall Space Flight Center, and the Kennedy Space Center, ACES is pushing the boundaries of military on-site construction using as little money and manpower as possible. The project has undergone two years of testing with structural engineering experts from the Chicago office of Skidmore, Owings & Merrill, who had previous experience working in 3-D printing through a project with the U.S. Department of Energy. After several iterations, the group concluded that construction time on such structures could shrink to a single day as opposed to five days, the average amount of time it takes to build wood-framed barracks. Printing concrete barracks would also eliminate the need to ship construction materials for conventional barracks by instead using local concrete from wherever the build-out would occur. For this prototype, ACES spent $6,000 and in addition, found out that it would take just three trained crew members per shift for three continuous printing sessions to build the barracks. Though exhausting, the process is even less labor intensive than basic barrack construction. While 3-D-printed building technology is looking more viable every day, it’s not perfect yet. According to ENR, SOM said that pre-testing the performance of the concrete is imperative and that the printing process must not be interrupted to ensure overall structural efficiency. Cracks from shrinkage can occur on long, straight walls as well, so ACES employed a chevron design that undulates, changing direction every two feet. ACES will do further testing over the next month to refine the technology and the construction process. They expect to be done with the project’s precast concrete roof in September and will then issue a report with design guidelines. During 2019, the group hopes to build four or five pilot machines for Marine Corps units to use in the field for additional evaluation.